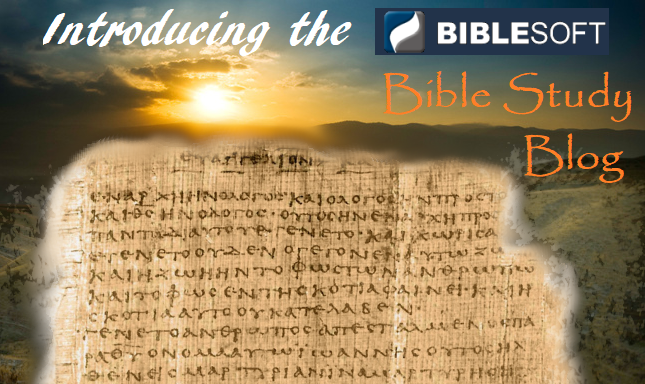 From the Scholar’s desk to Your screen—Introducing Biblesoft’s Bible Study Blog! Whether through seasonal Daily Notes or the more detailed articles of the various Exegetical Study Series, you will find a wealth of information on many verses and subjects. And it is all FREE for you to explore! We have been working (behind the scenes) for the past two years to create a place where you can study the Bible in addition to your PC Study Bible and OneTouch program (for PC and MAC). If you have not yet seen this site, you may be surprised at the amount of content—notes and articles—that is already here, and which can be accessed through searches or by browsing the topical keywords. Bible verses in the most recent and current pages are linked to a simple online Bible reader for quick reference, and this support eventually will be extended to earlier pages as well. We want to hear from you!—This is a study Blog, and even though we have not been including any user response thus far, we very much welcome questions, comments, observations on the subject matter or Bible passage under discussion in each note or article. If you have a question on a verse or topic, there is a good chance that other readers have asked a similar question. Your participation will add to the experience of the site, and we encourage it! Note of the Day—Daily notes on specific Scripture verses or passages, coordinated to follow the season of the Church Year–i.e., Advent, Christmas, Lent, Easter, Pentecost, etc., as well as other special times or events. Exegetical Study Series—Notes and articles on different subjects and areas of Scripture, with more extensive and detailed treatment. Recent series on this site are “The Law and the New Testament“, “Yeshua the Anointed“, “And You Shall Call His Name…” (for Advent/Christmas season), and the current series “Jesus and the Gospel Tradition“. Saturday Series—Launching in March 2019, this series takes a lighter approach, introducing readers to a critical and in-depth study of Scripture, one Saturday at a time. Definition and Explanation of Terms—These short articles cover a number of key theological or critical/scholarly terms that may be unfamiliar or misunderstood. Did you Know?—Interesting facts or observations related to the Note or Article, often involving a particular or surprising historical development. Comments or questions should be related to the particular Bible passage or subject matter of the article or note. General and/or ambiguous replies will either be ignored or deleted. Harsh, abusive or overly-argumentative language will not be allowed. Any such responses will be automatically deleted. Blantantly partisan comments, when partisanship outweighs the objective value of the response, will be ignored or deleted. We eagerly hope and expect that the current Bible Study Blog will grow and expand over the next year, including additional contributors and areas of study. Eventually, the content of the site will become integrated more fully into Biblesoft’s OneTouch study program, with greater opportunities for user involvement. Come and be part of this growth with us!